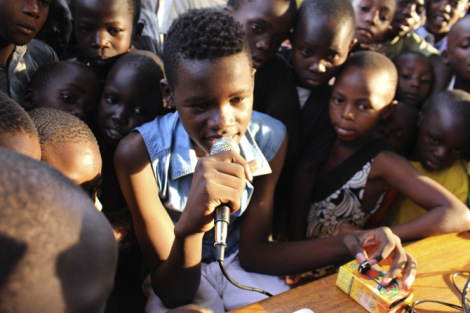 At a youth center in the slum area of Kamwokya, Venas was performing a live dubbing of media content in the local language over a microphone. This is a style of entertainment popularly known as VJing in Uganda. VJs, short for Video Jockey, are professional performers that translate and narrate over foreign films in makeshift shacks all over the country. But instead of Hollywood movies, youths at this youth center were VJing to re-narrate a UNICEF cartoon.